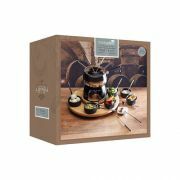 This is the ultimate party fondue set, ideal for meat, cheese or dessert. The party set includes six ceramic bowls, six stainless steel forks and spoons. 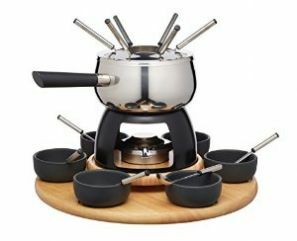 Also featuring a chafer gel fuel-powered burner that can melt a variety of cheeses in a polished deluxe stainless steel fondue bowl nested on a rotating wood base for easy access to everything by anyone. Gift boxed for the ideal gift.